After the first round of auctions with Blue Zoo Aquatics, we came to the mutual conclusion that sticking with our original plan, one of drop shipping the fish from here in Duluth to the final recipients, is going to be our preferred route going forward. I had so many direct inquiries asking why I had forced the fish to go through an extra trip to the west coast, and in truth, neither Mark nor myself had originally planned that. Quite simply, with a brand new daughter who has a penchant for screaming constantly and uncontrollably, it felt as if the only way we’d ever get the ball rolling on sales was to have me make one shipment to Blue Zoo. It worked, but public sentiment was definitely against the extra trip. With our decision to stick with drop shipping from Duluth, this means I need to hold, and segregate, most all of the maroons here to ensure that they don’t turn on each other in a murderous rage as fish are removed from the community. This means that all of the Maroons in my holding cubes, the ones that were destined to be distributed as backup pairs, held back for test pairings and breedings here, as well as smaller specimens, all need to be moved out to permit me to segregate the remaining 25 or so fish that we’ll be selling. I’m running out of space. In an effort to free up holding cubes, I’m pushing to place and pair many of the fish I’ve been holding in segregation. As you’ve probably read in the past, I’ve planned several backup pairs to be spread around the city and country, just in case anything were to ever happen to our home or fishroom. So, this Friday, August 2nd, 2013, another one of those pairs was selected from my holdbacks and placed under the care of the staff at the Great Lakes Aquarium (GLA), our local public aquarium situated on the shores of the Duluth Harbor / St. Louis Bay, Lake Superior. The Great Lakes Aquarium is mainly a freshwater aquarium (all “permanent” exhibits are freshwater) as the mission is primarily to educate visitors about the waters in our region. As such, it’s fair to say that when we first moved to Duluth, the marine hobbyists I knew didn’t exactly give it a “must see” rating. I think it took a year and a half before we ever stepped foot in our own public aquarium. Since that time, I’ve come to grow fond of our local aquarium. The facility is wonderful, the building is beautiful. With a family membership, we can escape there for an hour or a day, and it’s very kid friendly. Ethan loves it (the water table, the treehouse slide, and the bear den are his perenial favorites). Even though the GLA has suffered budget setbacks and more than one oversight change since it opened in 2000, it’s worth the visit if you’re here. I can only say things continue to improve and yes, more and more saltwater displays are making their way into the aquarium. Like it or not, I think everyone understands that “Nemo”, “Seahorses” and Otters are a likely larger draw than Largemouth Bass and Rainbow Trout; while the mission is most admirable, it’s difficult to accomplish if people aren’t lining up to see the same fish they caught when fishing the day before. Ultimately, I look at the Great Lakes Aquarium and see an organization that is growing, refining, and only improving, something I can be ever more proud of to call my home aquarium and an institution that our city should be very proud of and continue to prioritize. Heck, with Sepia bandensis on display from none other than Rich Ross at the Steinhart, and a fledgling new coral reef aquarium as part of the Fire, Ice, and the Rise of Life (see Lake Superior Magazine | Great Lakes Aquarium website) introduction to the history of our region (which happens to include a new Chambered Nautilus exhibit), offerings that will draw the layperson in are on the uptick. There’s plenty of massive envy-inducing Brook Trout still on display, the likes of which I’ll never catch in the wild! So when it came time to think about a public aquarium where I could place a Lightning Maroon for public viewing, I certainly had options. I grew up with the Shedd and still have acquaintances who work there. No doubt, many of my other friends who work at and run public aquariums would have welcomed the contribution, east coast or west, north or south. Ultimately though, my humble home of Duluth, Minnesota, is where the Lightning Project took place. It’s where a single wild variant spawns and tends here eggs, and where her progeny have grown up and in turn been sent back into the aquarium hobby. 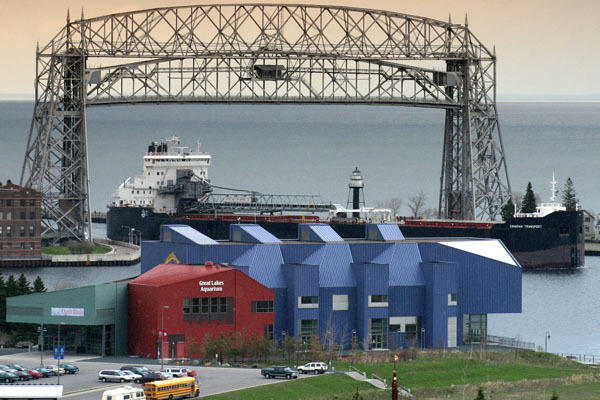 As much as the Lightning Project is a PNG story, a SEASMART story, a Pacific Aquafarms story, a Blue Zoo Aquatics story, or a Matt Pedersen story, it is also now a Duluth story. We’ll probably never have a MACNA in Duluth, MN. Heck, we’re lucky to get 10 people to a meeting of the Lake Superior Marine Aquarium Club (LSMAC). For a small city that’s welcomed me and my family with kindness and support, it is only fitting that I give back to the home I hope I never have to leave. There really was only one choice, and having had the help of folks like aquarium staffers Barb and Heidi earlier in this project (they actually were here and witnessed the spawning of the first successful offspring, the fish they are now holding), the Great Lakes Aquarium truly was the only and best choice. I’m really glad they accepted my offer. The details of my donation to the aquarium are simple. The fish were provided freely (obviously) and the only stipulations were these. 1st, if the aquarium for some reason could no longer house the fish, that they be returned to me, and 2nd, the eggs are mine if I need them. In other words, they are a backup pair for my fishroom and another avenue of genetic diversity to help keep mutliple F1 pairs out there in production, which in turn keeps the genetics diverse in the greater population. The more F1 fish we have producing F2 fish, the better we are from a big-picture standpoint. …and simply driven to the aquarium. Just about as stress free a trip as they could ask for. I gotta say, I kinda felt like Santa once I got there. I have never seen gossip travel so fast through a workplace; it seems like anyone who COULD get away and sneak a peek, did just that! 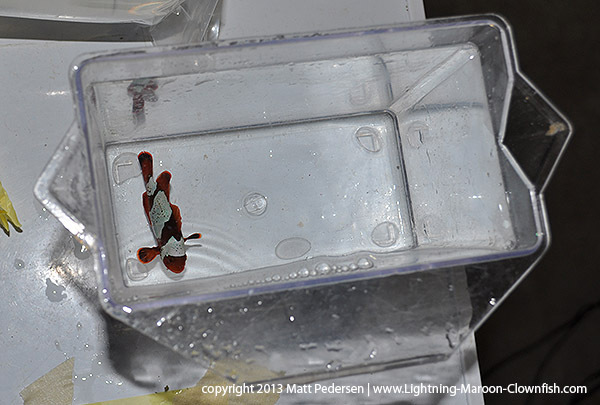 GL1 and GL2 floating for acclimation in the behind-the-scenes quarantine tank where they will be conditioned and paired before going on display. 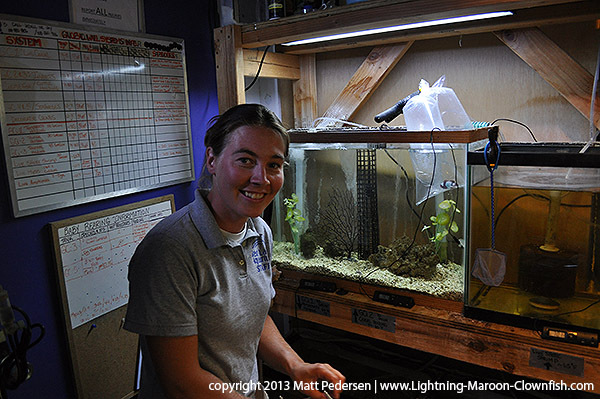 Of course, I think Jadell (will withhold her last name for privacy) was both the happiest and most stressed, as I believe it is she is the one who manages the marine exhibits (including the fantastic Seahorse breeding) and has been put in charge of the Aquarium’s Lightning Maroon and mate. She hides her nervous terror well behind that beaming smile. Don’t worry Jadell, I know that feeling; I knew it when their parents first showed up here. Jadell, you’ll do great, I know you will! And no worries, there are more if you need ‘em. 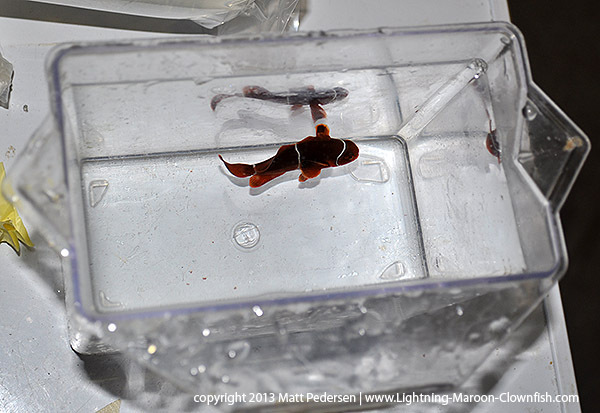 No word on when we’ll have these fish paired and ready for display, but I think it’s going to take 3 to 6 months before a solid pairing can be created using segregation and forced size differentiation to ensure that the Lightning Maroon grows faster and larger than the White Stripe sibling. When ready, Jadell has told me that this middle aquarium is due to be the new, revamped home for the pair. 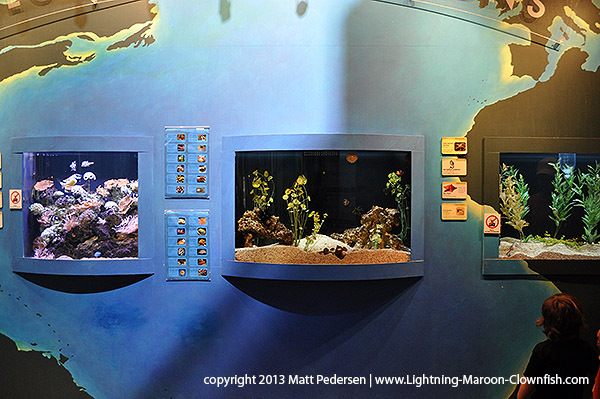 The aquarium in the center is the currently planned new display home for the Lightning Maroon and her mate, when the time comes. You can be sure that I’ll continue to watch this pair and post an update when there’s some news! You may never get to come into my house to see the original Lightning Maroon, but for the price of admission, someday soon you’ll be able to see one in person at the Great Lakes Aquarium. I keep tabs on the internet and once in a while go out and scour for new links to add to the links page here. One of the many I found this evening is a lively discussion that cropped up on SoCaliReefs.com. First, thanks for the enthusiasm guys; I hope you all enjoy the journey! But I have to jump out there and do a little bit of mythbusting. I have to bring up my good friend Rich Ross, author of a fantastic series of articles called the “Skeptical Reefkeeping” – see Part 1, Part 2, Part 3, Part 4, and Part 5. To drastically paraphrase, he would probably tell you that perhaps you shouldn’t believe everything you read, particularly on the internet, and especially in a reefkeeping forum. Rich’s articles are MUST-READS for anyone using the un-curated internet as their primary information source. 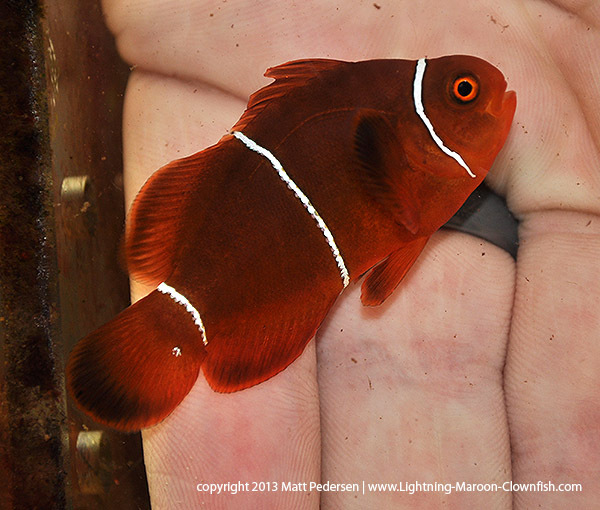 Yes, I did breed this Lightning Maroon clownfish with another maroon, but specifically another white stripe maroon clownfish collected from the same small island (Fisherman’s Island) in Papua New Guinea. Certainly not a random “average” maroon, but a very specific broodstock choice. Why not 2 lightnings? Because I only have the one. As far as decreasing the amount of lightnings in a clutch – well, frankly that’s jumping 10 leaps ahead of where our knowledge base is at this point. First, we don’t know that this is genetic. Second, if it is genetic, we won’t know what type of genetic trait it is. It could be recessive (like albinism), which could mean NO lightnings in F1 generation (unless the mate carries the recessive gene as well). It could be straight up dominant (which would mean potentially 100% Lightnings). It could be something far more complicated, be it partially dominant (Snowflake in A. ocellaris is an example of a partially dominant trait; mate two snowflakes together, and you get 25% Wyoming Whites). It could be co-dominant, multiple alleles…who knows. No one. On the first count, yes, as far as I am aware, there was the first one, collected in 2008, and the second one, in 2010. Where you’re incorrect is in suggesting that I had “both of them” at any time…I have only owned the one. Yes, I have been working for 2+ years on this breeding project, but not all of that time was spent directly attempting to pair the fish; many months were spent holding out for more broodstock from Seasmart in PNG, which unfortunately never materialized. Only once I knew that the requested large Female PNG Maroons I wanted weren’t going to come, did I change plans to start working with what I already had on hand. Simply put, categorically incorrect. There has never been any “Lightning Maroon PAIRS“. The first one collected…I’ve heard rumors about its fate. Ultimately, the single fish I obtained did have offers on it that were stratospheric, but in the end, through the decisions of multiple people, the fish wound up in my hands. I DID pay quite dearly for them, as some of my local hobbyists can attest (I sold tons of valuable livestock to help fund this purchase, and even then it did not cover the total investment in this project). Unfortunately again, these statements are simply riddled with misinformation. 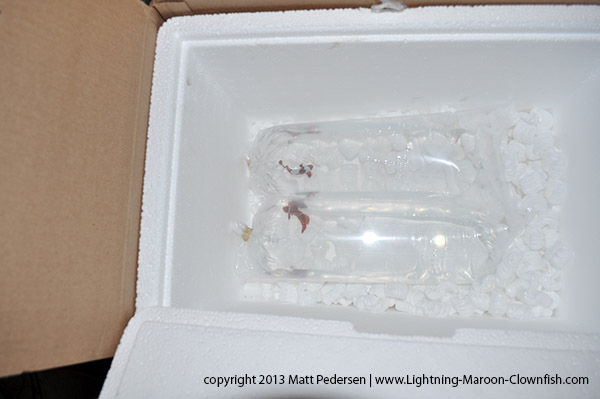 To say two females were caught is not knowable; both fish were brought in as singles, without mates, and in the case of the Lightning Maroon I now take care of, I am beyond convinced that the fish was originally still male when sent to me. Also, I may have to take issue with your choice of the word “gave”, as in fact all fish in this project were paid for. No free lunches here. But you are right; the reasoning behind using other Maroons from the same geographic area is simply to increase the odds that if genetic, and if recessive, we could stumble upon some offspring in the F1 generation due to the mate being heterozygous; in layman’s terms, the odd chance that the mate carries a “hidden” Lightning gene. 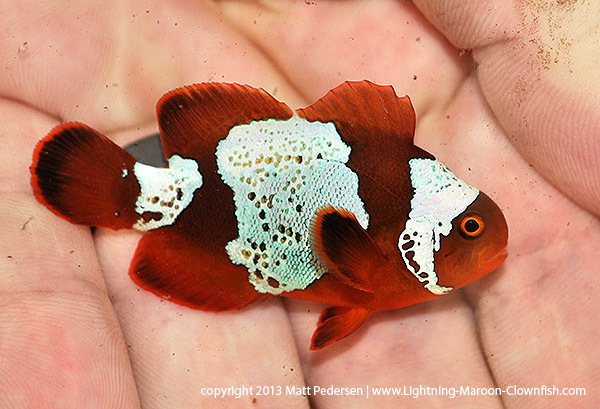 Maroon Clownfish are not endangered to the best of my knowledge. To answer your other questions out of order, I am going to go out on a limb and suggest that clownfish are probably among the easiest marine fish to collect in the wild simply because they are so site-attached and aggressive (willing to defend their anemones against far larger intruders..like divers). Regarding the “weak” question – well, I assume you’re referring to the recent spates of illness. At the moment they seem to have everyone stumped; I would at times ponder whether the Lightning is in fact much older than we might think (it is CERTAINLY a possibility; clownfish can live for decades in captivity, and in the wild, while perhaps not common, I am aware of a single Percula Clownfish in the wild that was said to be 32 years old upon examination). Imagine if this fish was already 10 years old when I got it; if that’s the case, it could already be quite near the end of it’s life (not ALL clowns live for decades of course). At the moment, it is anyone’s guess. Regarding these fish in general being “hard to keep”; wild caught clownfish are prone to diseases, particularly Brooklynella, which can make them far more difficult to work with. Wild caught fish can take months or years or more before spawning for anyone, if they ever do. Most aquarium hobbyist have been spoiled (in a good way) by the readily available and abundant supply of captive bred clownfish (of many species these days). Thus, there have been hobbyists who see the problems I have had with the PNG Maroons as a group over the past 2.5 years, and they question my abilities as a marine fish keeper and breeder. Then I talk to people who I truly respect, and know they speak from a viewpoint of experience, and I get told things like “you’re doing FANTASTIC” or “most people wouldn’t have made it this far.”. Knowing what I also personally know, I tend to look towards those with large experience bases who by and large, are supportive of my overall progress and have yet to question my abilities. The message to the everyday hobbyist, particularly the beginner? 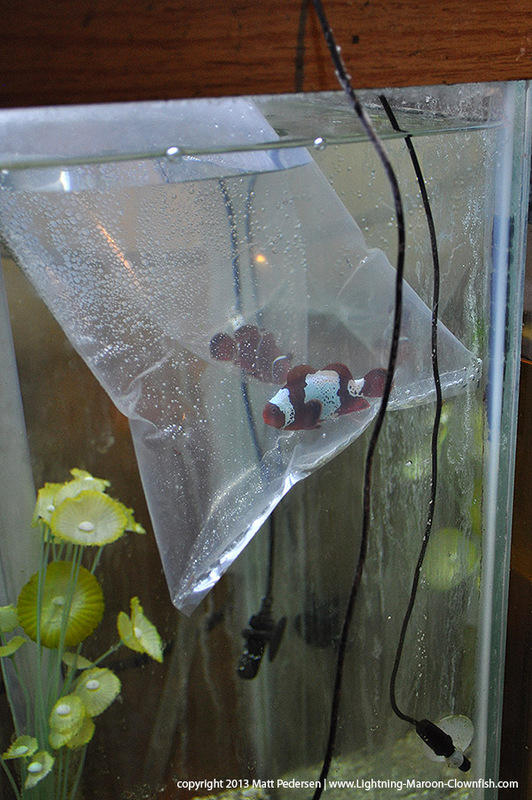 Make sure you start with captive-bred clownfish; save the wild caught ones until you have some experience. Optimistic thinking my friend, as we certainly do not know that yet. In fact, back in CORAL a while ago, I believe Wittenrich went on the record in a pro-genetic stance, while verteran Moe took the opposing viewpoint. If these two wind up on opposite ends of the prognostication, well, I’d say making definitive statements like that are simply premature. I HOPE you are right el dude, but you have no way of knowing yet. It’s amazing how even when the information is publicly out there for anyone to read (as this project has been online since day one), that so much misinformation can be floating around out there. In fact, I’m pretty sure this isn’t the first ‘fact check’ post I’ve had to do (given that I have a “tag” for “Fact check” already in the system!). Of course, it’s fun to speculate and debate, and to the casual web reader, just remember that just because you read it on the internet, doesn’t make it even remotely true. Updates on the babies coming soon! The very next web post I came across is this one - http://www.reefcentral.com/forums/showthread.php?p=20437213 - wow, more mis-info. I can’t say this is untrue, although here’s some things that call this into question. First, I believe I have enough industry contacts going around that someone, somewhere, would have spilled the beans knowing about this project. So unless Dan Navin is a lying, that categorically means that there have been no PNG Maroons of any kind, let alone Lightning Maroons from PNG (the only place they’ve been found thus far), entering the US, let alone a wholesaler on 104th street in LA, since SEASMART last shipped fish in mid 2010. So unless “last month’s LA Lightning” was collected in another location (certainly possible), all the information and experience I have is pushing me to think that lostmyz is not correct. Oh, and just a hunch; any LA wholesaler who got their hands on a new wild-caught Lightning Maroon would have talked it up to the world; we probably would’ve seen pictures and a bidding war. mutation? unknown and unproven. No way you could know one way or another. genetics causing issues with the Lightning’s health? possible, but unlikely given that the mate has also shown problems in the past few months. When that last point was brought up, lostmyz wrote – “i stand corrected about the fry… but the rest holds true… ” – at best, you can hope for that, but categorically stating it’s a mutation, and making other bold statements that you can’t prove, means that you cannot say with certainty that the rest holds true. The rest, is all unsubstantiated at best at this point in time. HANG TIGHT, no more updates to this post as I’ve finished my Google results for the week On to the news!